Written by a celebrated math educator, this innovative inquiry encourages critical thinking and sparks memorable mathematical conversations. Children and their parents answer the same question about each set of four shapes: "Which one doesn't belong?" There's no one right answer--the important thing is to have a reason why. Kids might describe the shapes as squished, smooshed, dented, or even goofy. But when they justify their thinking, they're talking math! Winner of the Mathical Book Prize for books that inspire children to see math all around them. Christopher Danielson has taught math to learners of all ages. He now uses his PhD in mathematics education to create books and toys to support children's math development. Christopher is the developer of Math-On-A-Stick, an annual family math event at the Minnesota State Fair. 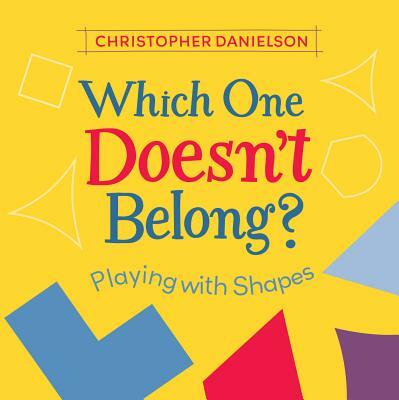 ♦ A math concept book that encourages creative thinking and celebrates all answers, as none are wrong! A lengthy introduction of five and a half spreads introduces readers to the kind of mathematical thinking Danielson is encouraging. The first spread matches the final ones and presents four shapes, asking readers: "Which one doesn't belong? Why?" The next spreads explain how every answer is correct—one needs only to support it. Is it the triangle among the quadrilaterals? The one shape that is an outline instead of a solid color? Nine spreads then follow that each present kids with four new shapes and the same questions, bold colors attracting and holding interest as kids pore over the similarities and differences. The author's note emphasizes that "All properties count here; all ideas matter….You're thinking in a mathy way when you notice sameness and difference for one property at a time." And refreshingly, Danielson doesn't care about technical language—observations trump terms, so don't worry about describing them as "smooshed…dented…or colored in"; just describe them. This is one shape book that will both challenge readers' thinking and encourage them to think outside the box.